Want to try great apps without hurting your wallet? We’ve selected 57 iPhone, iPad and iPod touch apps that are now free. 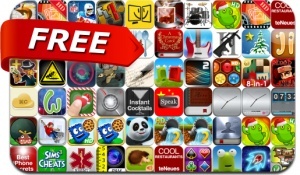 This apps gone free alert includes Aiko Island, Forever Lost Ep. 1, The 7th Guest: Infection, Friendle+, Wimp: Who Stole My Pants?, Flower Board, Hyperlight, Join It, Aiko Island, GraalOnline Era+, Gravitarium2, Social Diary and many others.